Although the consensus in the field of modern Icelandic linguistics attributes relatively little foreign influence on the national language claiming that the Icelandic vocabulary tends toward the rejection of loanwords (cf. kvaran 2004a,b), several studies have pointed out that such influences have always been present and that Icelandic is not to be considered an isolated or pure North Germanic language (see fischer, óskarsson, westergård-nielsen among others), not even at its oldest stage. In my research I have collected what I consider to be a large majority of the Icelandic loanwords that have their roots, either directly or indirectly, in Latin (although they may as well be loanwords there already) and are still used in the language (see tarsi). Latin has been chosen due to the fact that such a corpus pervades the Icelandic lexis, especially from a semantic point of view, and makes actually possible to have a broad view of it since borrowings of Latin origin come from very different directions which also happen to be the main sources Icelandic borrowed words from during the centuries (cf. infra). In the present paper an account of the corpus’ nature will be provided in order to show how such a vocabulary is tied neither to a particular historical period nor to a singular semantic field (§ II), then some words will be analysed because of their etymological peculiarities or their importance in the Icelandic language history in relation with linguistic purism (§ III). Finally some conclusions will be drawn (§ IV). Loanwords in Icelandic come from a variety of different directions and their history tells us not just how native speakers accepted them into their language but also tracks this North Atlantic population’s cultural history through the acquisition of foreign words and their subsequent adaptation to the native language’s phonetic and morphologic systems. The corpus, which constitutes the core of my research, includes more than four hundred words which strictly speaking are not all to be considered Latin loanwords but show nevertheless the cultural influence that Latin has had on Icelandic either directly or indirectly through several other languages like Old English, Middle Low German and Danish. The words have been collected during a period of eighteen months from both written and oral sources. In the following paragraphs I will present different ways to group the corpus, namely chronological, by language of acquisition and semantics. The Writing Era (Ice. ritöld) is considered to begin in Iceland during the eleventh century as the Latin alphabet began to be used to write texts such as law books, annals and religious works (cf. karlsson). Nevertheless there were various loanwords already extant at that time which had been acquired long before the Settlement Age of Iceland (Ice. landnámsöld, 870-930) and some of them are even dated to the first direct encounters the Romans had with the Germanic populations in the first centuries AD. The corpus might therefore be seen as containing two typologies of words: namely pre-Settlement and post-Settlement. The words belonging to the former are ancient direct Latin loanwords while in the latter they are mostly indirect, namely from Old English, Old and Middle Low German, Old French, Danish and Modern English (cf. raschellà). This latter typology constitutes more than the 90% of the entire corpus and witnesses the various influences Iceland has been subjected to from the days of its conversion to Christianity, in the beginning of eleventh century to present day. 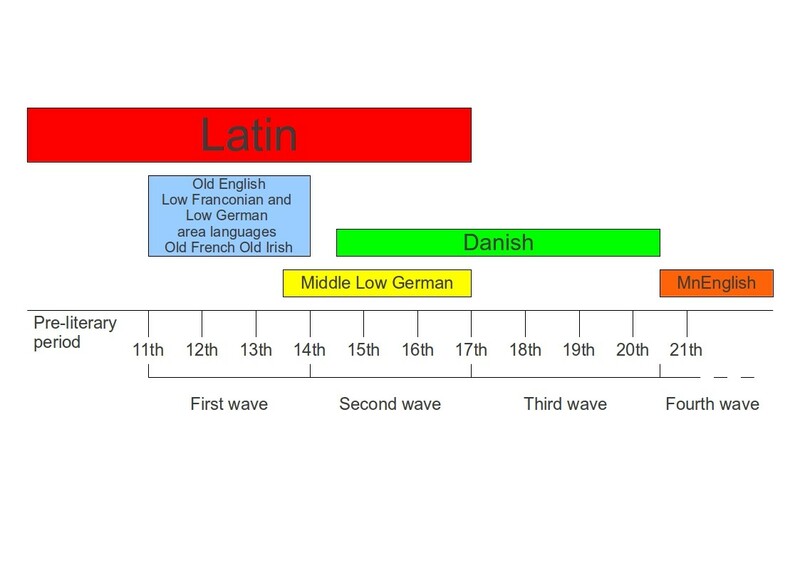 It could be said, setting the pre-Settlement words apart, that with respect to loanwords of Latin origin Icelandic had four major borrowing waves which correspond to four major borrowing languages, Latin excluded, namely Old English, Middle Low German, Danish and Modern English. These waves are to be examined with an eye fixed on Icelandic history. The first wave, from the 11th to the 14th century, contains mainly religious terms borrowed from Old English and the Low Franconian/German linguistic area (see óskarsson), such as altari ‘altar’ (Lat. altare), engill ‘angel’ (Lat. angelus), munkur ‘monk’ (Lat. monachus), postuli ‘apostle’ (Lat. apostolus) and prestur ‘priest’ (Lat. presbyter). In addition to these, there are a handful of other terms belonging to different semantic fields and borrowed also from other languages, such as glósa ‘written note’ and kær ‘dear’, both from Old French. The religious words have been acquired during the Conversion, and follow a precise borrowing path: the majority of them have been assimilated via Old English, whose speakers were Christian missionaries, whilst the Low Franconian and Low German speaking area has to be named for the same reason (see also halldórsson). A second wave of borrowings (from the 14th to the end of the 16th century) is to be ascribed to the continuous and economically important contacts Scandinavia had with the merchants of the Hanseatic League. These contacts were also established between the League and Iceland, either directly (especially during the 16th century) or indirectly, with the Danes as intermediaries (cf. braunmüller). Numerous words of Latin origin, borrowed from Middle Low German or Danish and related to traded goods, are to be found prominently in the written sources from this historical period, e.g. byssa ‘gun’ (Lat. buxis), engifer ‘ginger’ (Lat. zingiber), pappír ‘paper’ (Lat. papyrus). Still striking is the religious lexicon, which might well have been to some borrowed, at least in part, during an older period. As an example of the latter there are words such as grallari ‘gradual’ (Lat. gradualis), predika ‘to preach’ (Lat. prædicere), preláti ‘prelate’ (Lat. prælatus) and sakramenti ‘sacrament’ (Lat. sacramentum). The beginning of the seventeenth century marks the start of a massive Danish influence on Icelandic due primarily to the fact that an absolute monopoly on Icelandic commerce was set by the Danish Crown in 1602. This influence, which reaches its highest point during the 17th and 18th century, has a longer history than the monopoly itself, namely during the 19th and the first half of the twentieth, Iceland at the time being a colony bound to Denmark not just economically, but also culturally. The Icelandic cultural and political élite was largely educated in Copenhagen, a city that was also the focal point of the growing Icelandic nationalist movement. Loanwords dating back to this period are for example dósent ‘associate professor’ (Lat. docens), kollegi ‘colleague’ (Lat. collega), kúrs ‘university course’ (Lat. cursus), major ‘major’ (Lat. maior), maskína ‘machine’ (Lat. machina), sekreter(i) ‘secretary’ (Lat. secretarius). A last borrowing wave chiefly regards Modern English and starts approximately with the country’s occupation operated by British and then American troops during World War II and reaches the present day. This last wave did not, according to the results of my research, introduce many words of Latin origin, although it has been a prevailing trend since the Forties. Nevertheless a few highly frequent words are worth mentioning: djók ‘joke’ (Lat. iocus) and spes ‘special, extraordinary’ (Lat. specialis). According to the results of my research, the vocabulary of Latin origin has been borrowed from several different languages, if not directly from Latin itself. I shall first address the latter case and give an account of direct borrowings. These are of two types: early and late borrowings. The former, as previously mentioned, are to be considered in a far wider manner than late loanwords, as common Germanic Latin loanwords (cf. raschellà). This group is formed by words such as eyrir ‘ounce of silver, now 1/100 of a króna, the national currency’ (Lat. aureus), kaupa ‘to buy’ (Lat. caupo), keisari ‘emperor’ (Lat. Cæsar), ketill ‘kettle’ (Lat. catillus), kjallari ‘cellar’ (Lat. cellarium), vín ‘wine’ (Lat. vinus) and the morpheme -ari ‘-er’ (Lat. -arius). On the other hand, the latter consists of so-called learned loanwords, whose borrowing period spans across the centuries. Early loanwords of this typology are for example the names of the months, assimilated into Icelandic, possibly, due to the conversion to Christianity and preserved in their original Latin form in the oldest section of manuscript GKS 1812 4to, which dates back to the last decade of the 12th century (cf. larsson and onp). Later on other learned words found their way into Icelandic, especially when semantically related to the cultural/educational sphere or, again, of ecclesiastical relevance; to the purposes of this paper it will be enough to quote a few of them such as annáll ‘annal’ (Lat. annalis), doðrantur ‘tome’ (Lat. dodrans), doktor ‘doctor (s.o. holding a PhD-degree)’ (Lat. doctor), fígúra ‘figure of speech’ (Lat. figura), kardínáli ‘cardinal’ (Lat. cardinalis), persóna ‘person’ (Lat. persona), postilla ‘collection of sermons’ (Lat. post illa (verba textus)) and prófeti ‘prophet’ (Lat. propheta). Indirect borrowings follow to a great extent the path outlined in the previous paragraph, i.e. their acquisition is due to the historical foreign influences Icelandic had been exposed to. These are in fact the languages through which it enriched its lexis with regard to words of Latin origin: Danish, Low Franconian and Low German area languages (at their ancient or middle stage such as Middle Low German), Old English, Old French, Old Irish and Modern English. The following words may be cited as tokens: kollegi ‘colleague’ (Danish), akkeri ‘anchor’ (Lat. anchora) (Old Dutch) bikar ‘beaker, cup’ (Lat. bicarius) (Old Low German), páfi ‘Pope’ (Lat. papa) (Middle Low German), klaustur ‘cloister’ (Lat. claustrum), musteri ‘temple’ (Lat. monisterium) (Old English), asni ‘donkey’ (Lat. asinus) (Old French), köttur ‘cat’ (Lat. cattus) (Old Irish), djók ‘joke’ (Modern English). As previously mentioned, the corpus is by no means tied to one or merely a few semantic field(s), although it might well be noted that some of them are quantitatively predominant. In fact, for reasons similar to those enumerated above, the fields related to religion, literary culture and education, science and time are the richest. Even though this is not to be regarded as an unexpected result as similar outcomes may well be observed in cognate languages, such classification offers a fairly clear overview on the size of this phenomenon. With the purpose of dividing the corpus into coherent semantic groups, I proceeded first by sorting the words into macro-categories which I then eventually divided into two or more subgroups so as to reach a higher grade of precision. The macro-groups consist of loanwords falling into the following semantic fields (word examples in brackets): (I) Literary Culture and Education (frasi ‘idiomatic phrase, fixed expression’ (Lat. phrasis), mórall ‘moral, morale’ (Lat. moralis), prófessor ‘university professor’ (Lat. professor), rím ‘rhyme’ (Lat. rythmus), skrifa ‘write’ (Lat. scribere)); (II) Religion (biskup ‘bishop’ (Lat. episcopus), djöfull ‘devil’ (Lat. diabolus), messa ‘mass’ (Lat. missa), prestur ‘priest’); (III) Science (massi ‘mass’ (Lat. massa), mínúta ‘minute’ (Lat. minuta (pars)), flensa ‘flu’ (Lat. influentia), pund ‘pound’ (Lat. (libra) pondo)); Nature (fálki ‘falcon’ (Lat. falco), ljón ‘lion’ (Lat. leo), náttúra ‘nature’ (Lat. natura), planta ‘to plant’ (Lat. plantare)); (IV) Household, Clothing and Military Terms (edik ‘vinegar’ (Lat. *atecum < acetum), múr ‘wall’ (Lat. murus), mynta ‘mint’ (Lat. mentha), keðja ‘chain’ (Lat. cadena), kempa ‘hero, warrior’ (Lat. campus), kjóll ‘dress’ (Lat. curtus), perla ‘pearl’ (Lat. perula), spegill ‘mirror’ (Lat. speculum)); (V) Administration and Commerce (kosta ‘to cost’ (Lat. constare), kommúna ‘community, colony’ (Lat. communio), regla ‘rule’ (Lat. regula)); (VI) Miscellanea (fínn ‘smart, elegant, fine’ (Lat. finis), kapteinn ‘captain’ (Lat. capitaneus), tígull ‘rhombus, diamonds (cards)’ (Lat. tegula), rúta ‘coach (bus)’ (Lat. rupta (via))). However, it could not be avoided to let some loanwords stand outside of this taxonomy, since they do not fall into any of the aforementioned categories (form ‘form’ (Lat. forma), pláss ‘space, village (e.g. sjávarpláss ‘fishing village’)’ (Lat. platea). If these three criteria were crossed with one another it could easily be seen that, although words from a specific semantic field and/or source language could be dominant as early attestations in a century’s written language words from other dominions and/or source languages pop up as well. This means that the borrowing process has never been, strictly speaking, univocally tied to a single sphere, nor has it been tied to a single source language. On the other hand, pursuing a similar analysis for an individual semantic field not all the terms have been borrowed at the same time, nor, with a source language as a starting point, did all the borrowings come at once. In this paragraph I will present a handful of words worth mentioning for their etymological or linguistic-historical interest. The following analysis will be as accurate as possible, as I will also address some critical issues. Icelandic has nowadays two words that are, to some extent, used as synonyms for the same exotic animal, the camel, and it has had them at least since the second half of the 13th century. Although both terms, úlfaldi (which can also describe a dromedary) and kamel, appear in 13th-century Old Norse texts (see onp), comparative etymology reveals us that the former must be an older borrowing as it already appears in Gothic (ulbandus), as well as in cognate languages like Old English (olfend), Old High German (olbenta), Old Saxon (olbundeo), while the latter is, according to blöndal magnússon, a loan from Middle Low German kam?l and from which I will begin. One of the earliest examples of Icelandic kamel appears in Karlamagnússaga ok kappa hans as it is preserved in manuscript NRA 61 (Riksarkivet, Oslo). This saga is one of the riddarasögur or chivalric sagas whose tradition started in the Old Norse linguistic area with the translation of French chansons de geste. I disagree with the etymology proposed in the Icelandic Etymological Dictionary because of two facts, namely a) that the word appears in a work influenced by Old French literature, and b) that postulating that it was taken from Old French it neither stands as an hapax in the corpus, nor does its derivation face phonetical derivational difficulties of any sort (see infra). I shall therefore agree with Jóhannesson’s etymology, namely that it is likely to have been borrowed via Old French, i.e. chamel, rather than Middle Low German. If this is true, then the borrowed form was probably of Norman French origins with /ch/ realized as [k] as a similar outcome is to be found in Icelandic kær (< Onfr. ker, cf. blöndal magnússon). Icelandic úlfaldi has instead a quite controversial and to some extent obscure etymology as not all scholars agree on the origo prima of this word. Etymological dictionaries like those by Jóhannesson, de Vries and Blöndal Magnússon for Icelandic but also Lehmann for Gothic, describe it as a borrowing from Latin elephas, which had in turn been borrowed from Greek and shifted its meaning from that of ‘elephant’ to ‘camel’ in the Germanic languages. It is nevertheless worth saying that a probable cognate with the meaning ‘elephant’ is present e.g. in Old English, elpend and ylpend, and Old Icelandic, olifant. Moreover, the term ‘elephant’ in ‘make an elephant out of a fly’ is generally translated in Icelandic with ‘úlfaldi’ whereas the Latin version is ‘elephantem ex musca facere’, already recorded by Erasmus of Rotterdam in his Adagia. Blažek, quoting Puhvel, does not agree on any connection between Greek and Gothic regarding this word; in fact he writes (blažek, pg. 20): Gothic ulbandus “camel” with its counterparts in other Germanic languages is not borrowed from Greek ?????? ?° , but it is connected with Hittite huwalpant- “hunchback, humpback” […]. The regular Germanic continuants of the Greek “elephant” are e.g. Old English elpend, ylpend, Old High German elpfant, elafant “elephant”, borrowed via Latin. Accepting a relationship between Hittite and Gothic does not solve the puzzle we have here, if it does not complicate it more, since it is still not clear from where and how this word came into the Germanic linguistic area, if not a borrowing. Moreover the Icelandic version of the saying cited above compared with the present meaning somehow witnesses, if not the passage, at least some probable confusion within the two animals. Given all the data above, I agree on the etymology that establishes that the word came into Germanic as a borrowing from Latin. However, it may be also suggested that this word not a direct loanword, but came into Icelandic through some other language such as Old English or Middle Low German. Chess has been introduced in Iceland probably short after the Conversion. The pieces’ names in Icelandic suggest to us their origin, and from this we can also speculate as to how this strategy board game reached these northern lands, since the game had likely been introduced in Iceland by Old English speakers (see fiske, pg. 4); I suggest most probably by missionaries. In this paragraph I will discuss the etymology of the rook (Ice. hrókur). Comparing its name in English and Icelandic with the other European ones a sort of isogloss between the former two is established, since these two languages preserve the presumably original eastern name, namely a cognate of Persian rukh, whereas the Scandinavian languages and all the major European languages use instead a cognate to English tower, Romance languages included. The name however has been borrowed originally from Medieval Latin roccus, as also du Cange let us infer being instead its homophone a loanword of Germanic origins (cf. It. rocca). All the Icelandic pieces’ names follow the English ones and it is of course chiefly for this evidence that, when they are not translations of them (as for instance riddari ‘knight’), they have been borrowed via Old English, whereas in this latter language they may well be of French origin. In fact there may still be evidence found for this piece’s name in the Romance languages, namely what in English is called ‘castling’ and instead f.e. in French ‘roque’. The etymologies proposed by Jóhannesson, Blöndal Magnússon and de Vries do not however take into account these facts and track hrókur directly back to Old French roc. In another case, that of peð ‘pawn’ (Lat. pedo), it is either presented as a direct Latin borrowing or through Old French pedon, whereas I would possibly see a passage through Old English, having considered the evidence above. If there is a loanword which is “very Icelandic”, that is dóni ‘boor, lout’. This word is not attested in any other language and it appears in written language starting from the 17th century (see ritOH). For this word there are two possible etymologies: on the one hand the proposition by jóhannesson, who attributes it to Sp. don through ME. done; or on the other hand the proposition by blöndal magnússon, whereby the term is likely to be a shortening of the Latin name Corydon, used by Virgil in his Eclogues, denoting a shepherd. Both proposals agree upon the fact that the term had first been used by school pupils in their jargon. If this is true, setting for the moment apart which of the two etymologies appears to be the likelier, it has to be taken into account that scholasticism on the island had been carried out from the eleventh roughly to the beginning of the nineteenth century by the two episcopal sees: the northern one, Hólar, and the southern one, Skálholt. In 1785 the school at Skálholt was closed and moved to Reykjavík where it received a new name, Hólavallaskóli. A few decades later, in 1802, the school at Hólar ceased its activity and was merged with the new one in Reykjavík, which was moved a handful of years later to Bessastaðir and again to Reykjavík in 1846. This is to say that, by the time our word appears in literary works, it could have been adopted by pupils during the seventeenth century (if not already in the previous one) in either one or both schools. According to ritOH, the earliest written examples are preserved in two poems, one by Stefán Ólafsson and the other one by Bjarni Jónsson Borgfirðingaskáld. The former writer attended the school at Skálholt early in the 17th century while the latter never received an appropriate education. The same applies to a poet who lived in the second half of the 17th century, Guðmundur Bergþórsson, who also uses the word. Being that this is the evidence, it may be thought that the term saw the light of day some time after the Reformation among the pupils of Skálholt, as jargon, and spread subsequently some decades later (derived terms such as dónalegur ‘rude’ and dónaskapur ‘rudeness’ appear in written sources respectively in the late 18th century and beginning of 19th century, according to ritOH). Of the two etymologies quoted at the beginning of this section Blöndal Magnússon’s assertion should be considered the likeliest, especially in light of what Jakob Benediktsson has shown in an article specifically dedicated to this word, where he draws the same conclusions as above (see benediktsson). Religious borrowings from Latin in Icelandic are numerous. Among them there are some that have encountered a more or less strong semantic change, leading the original religious meaning to be highly specific, while the other ones, being the most used, were often created by analogy. In this section I will present three loanwords of this sort, namely pistill ‘epistle, sermon, article (newspaper), report (newscast)’ (Lat. epistola), prófastur ‘provost, archdeacon, resident in charge, puffin’ (Lat. præpositus), templari ‘templar, teetotaller’ (Lat. templaris). The first of the three, pistill, had been borrowed from Latin epistola via Old English pistol and is therefore one of those loanwords that had come into Iceland thanks to the Conversion. Its original meaning is strongly connected to the epistles found in the New Testament, i.e. an ‘apostle’s letter’, but nevertheless took on a wider role in the same semantic sphere reaching that of ‘sermon’, preserved in the idiomatic phrase lesa e-m pistil ‘tell sby off’. Analogical to the meaning just presented is that of ‘written announcement’, which lead to ‘article (newspaper)’. The latter then leading to the meaning ‘report (newscast)’, which no longer has a written connotation. Even though the religious meaning is still alive and used in the Church, the secular one is the most commonly used. Different is the case of prófastur, another borrowing from Old English, as the religious meaning, ‘provost, archdeacon’, is here still the main indication. Being a provost the chief of a diocese (Ice. prófastsdæmi), Icelandic uses the same word, often in combination with garða- ‘relative to a student residence’, so as to refer to the resident advisor. The zoological meaning ‘puffin’ is due to an analogy both in regard to its aspect and the way it ambulates. Our last word, templari, had come into Icelandic twice, borrowed first from Middle Low German templer, meaning ‘knights templar’, and then secondly in the twentieth century from Modern English good templar, being therefore templari a shortening of the calque góðtemplari. The shift in meaning is here not due to Icelandic but English, since the latter version came forth first as Fremdwort and subsequently translated. The terms negatífur ‘negative’ and pósitífur ‘positive’ had been borrowed via Danish and appear in late 19th century sources, according to ritOH. Their Icelandic versions, neikvæður and jákvæður respectively, also appear in the same period (1886) in the translation by Jón Ólafsson of J.S. Mill’s essay On Liberty. These words represent all together, I reckon, a good example of Icelandic language purism’s word-creating side: namely this is the case of so-called “good” Icelandic words having been invented in an attempt to push loanwords out of the language, with the aim of re-shaping Icelandic solely using and combining, nota bene, what is felt as an Icelandic, Norse or more extensively Germanic language token. As it will be seen later on in this article the process just mentioned has not always been completely successful, letting sometimes, like in this case, both loanword and neologism live side by side. As it often happens in Icelandic, neologisms which aim to substitute loanwords are of a descriptive nature, i.e. the process used in creating them is that of pulling out the concept from an already-being or potential loanword and shaping a new word which not just covers the same conceptual spectrum but describes it in a more-often-than-not transparent way (cf. kristinsson). In our case both neologisms had been formed by juxtaposing the negative or the positive adverb, nei or já, to a root, kvæð-, roughly meaning ‘to say’ and related to the verb kveða ‘to say, to compose (a poem)’ (cf. Got. qiþan). This pattern is also to be found in other adjectives like f.e. einkvæður ‘monosyllabic’. Apart from its strictly grammatical interest these two single terms are important because they represent an era in Icelandic language history, namely the politically-characterized linguistic purism in its Romantic spring (cf. ottósson). This is of course not only the case of the terms just presented but an example of what was going on among the Icelandic intelligentsia during the 19th century. Icelandic national language purism with explicit and programmatic political connotations started in the last quarter of the eighteenth century, in Copenhagen, with the foundation of the íslenzka Lærdómslistafélag, a society whose aim was indeed that of preserving and purifying the language, especially by introducing a whole set of neologisms translating terms for new abstract and concrete objects instead of “Icelandicizing” the Danish ones. The society published a bulletin, called Rit þess íslenzka Lærdómslistafélags. Later on, in 1818, it converged into the Íslenzka bókmenntafélag, founded just two years earlier. The job carried out by this society was continued in the 19th century by an important literary review, Fjölnir, where, among others, wrote one of Iceland’s most important national poets, Jónas Hallgrímsson, who is here worth mentioning as he created numerous neologisms such as sjónauki ‘telescope’ and hitabelti ‘tropical belt’. This policy, whose prodromes date all the way back to the first written Icelandic sources (see astås), is still highly productive even though the neologisms proposed do not always take root and become popular. In the corpus that I have gathered there are some words that are not contained in any of the etymological sources consulted, even though they have a considerably high frequency in everyday language. Such words are e.g. djók ‘joke’, frasi ‘idiomatic phrase’, komment ‘comment’ (Lat. commentum), pása ‘pause, break’ (Lat. pausa), rest ‘remains, leftovers, change’ (Lat. restum), spes ‘special, extraordinary’. For each of these words, 47 in total, I have suggested a possible etymology, having considered both phonetic issues and their period of first appearance in written sources (cf. tarsi). In taking this process to completion I have come upon what I assume to be the youngest among the words of Latin origin in contemporary Icelandic, namely pírati (Lat. pirata). The meaning of this word is, maybe not surprisingly, the classical one of ‘pirate’, in the sense of ‘buccaneer, privateer’, for that meaning is covered by the native words sjóræningi and víkingur, but originally that of ‘one who does something without having any licence for that activity’. This meaning is to be found for example in the ham radio jargon; a few examples are available on the internet. A secondary and nowadays predominant meaning is that of ‘member of the Pirate Party’, for the word is used to refer to them and, in combination with flokkur ‘party’, to the political party itself, i.e. Pírataflokkur ‘Pirate party’. In this acceptation the term began to be used in the first years of the present century and its frequency increased as the Icelandic Pirate Party was founded in 2012. As sketched in this article, loanwords of Latin origin run across contemporary Icelandic lexis: some of them are deeply rooted in it and are not subject to attempts at substitution since they are probably not even seen as being “foreign”; while others experience the foreign versus native word dichotomy, namely they exist as loanwords but are nevertheless felt external to the proper linguistic norms, as the Icelandic term, often a neologism, is preferred. This dichotomy often leads to qualitative judgements about the speaker’s way of talking: having a minimum number of loanwords is synonymous with high-quality language skills and vice versa. This phenomenon is however not bound to the last historically tumultuous centuries, that is to the Icelandic Independence Movement, but is to be found as back in time as the start of Icelandic literary history. The reasons behind it are of course multifarious and it would be anachronistic to ascribe this tendency to a “nationalistic feeling” as early as the 11th, 12th and 13th centuries. Being these issues beyond our current purview, however I shall stop here. Compare these words with their equivalents in Old English (OE. ), Old High German (OHG.) and Gothic (Got. ): eyrir, from Pgerm. *aurijaz, whose cognates are nowhere else attested but in Icelandic; kaupa OE. ceapian, OHG. kouf?n, Got. kaup?n; keisari OE. c?sere, OHG. keisar, Got. kaisar; ketill OE. cetil, OHG. kezzil, Got. *katil(u)s (only attested in gen. pl. katile); kjallari OE. N.A. (Modern English cellar is a borrowing from ofr. celier), OHG. kellari, Got. N.A. ; vín OE. w?n, OHG. w?n, Got. wein; -ari OE. -ere, OHG. -ari, Got. -areis. ROCCUS (1) vox Germanica Rock, significans supremam vestem, ?????????. It. ‘arrocco’, Sp. ‘enroque’, Pt. ‘roque’.